Dates, the fruits of the date palm tree (Phoenix dactylifera L.), are a major staple food in arid areas of North Africa and the Middle East, and the date crop plays a central role in the economy and social life of these regions (Janick et al., 2008; Botes et al., 2002; El-Deek et al., 2010). There are more than 3000 date varieties in the world. Iran, Irak, Morocco and Tunisia have the most diversified germplasm (Zaid et al., 2002; Abdelmajid, 2005). While date palms are primarily cultivated for food, some local varieties are traditionally grown for animal consumption (Williams, 1978). The date palm is an evergreen palm tree that can reach 15-40 m in height. Its fasciculated root system can grow to a depth of 6 m (Zaid et al., 2002). The stem, or stipe, is cylindrical, straight, up to 1-1.1 m in diameter. The date palm bears 100-120 large fronds, 4-7 m long. Phoenix dactylifera is a dioecious species with male and female plants. A female tree bears about 12 inflorescences per year. These spikelike clusters of up to 10,000 flowers have a central rachis and 50-100 spikelets (Zaid et al., 2002; Ecocrop, 2011). 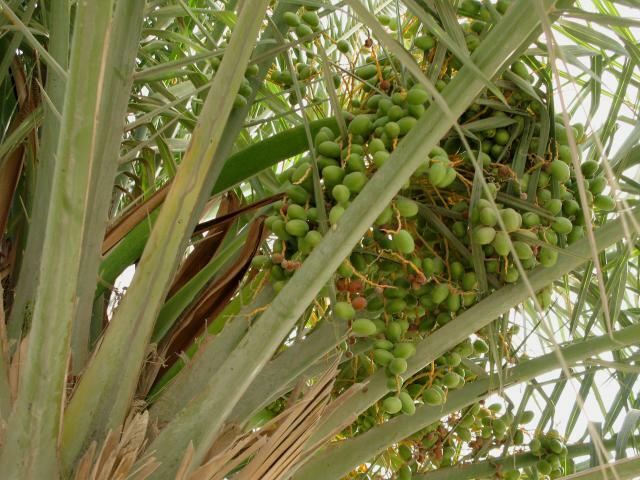 Date palm trees begin fruiting within 2 to 4 years and reach full production at 5-8 years (Ecocrop, 2011). 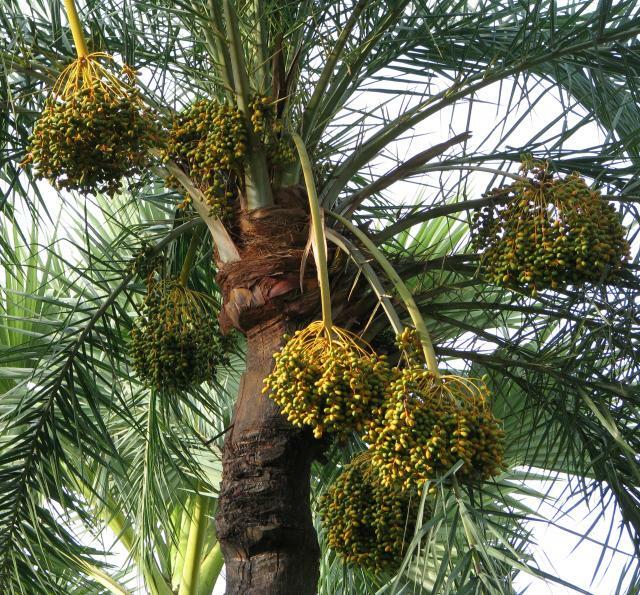 An average well-managed palm can produce about 60-70 kg of fresh dates per year but yields up to 200 kg/year can be obtained (Ecocrop, 2011; Peyron, 2000). The date fruit is an oblong, one-seeded berry, with a fleshy and sweet pericarp. Dates vary greatly in size (18 to 110 mm long), weight (2-60 g), colour (yellow to black) and taste. The date seed (also called pit, stone or kernel) is hardcoated, oblong and weighs 0.5 to 4g (Zaid et al., 2002). The date palm industry produces fresh and dried dates, whole dates and pitted (stoned) dates, date paste, date syrup and date wine. Date by-products include cull dates, immature dates, date pedicels, date seeds, date presscake and date molasses. All these by-products are used to feed animals. This datasheet deals with cull dates and other fleshy by-products. The other by-products are described in the datasheets Date seeds, Date leaves and pedicels and Date molasses. Phoenix dactylifera is also a useful agroforestry species with other uses than date production: the trunks are tapped for a sap that is made into palm wine and the leaves are harvested for thatch, fiber, basketry and fodder (Ecocrop, 2011). In 2009, 7.52 million tons of date palm fruits were produced worldwide. Date palm trees were planted in 1.15 million ha and the average yield was about 6.52 t/ha (FAO, 2011). The main producers were Egypt, Iran, Saudi Arabia, the United Arab Emirates, Pakistan, Algeria, Iraq, Sudan and Oman (FAO, 2011). Arab countries possess 70% of the world date palms (El-Juhany, 2010). Most of the production is consumed locally and only 10% were exported in 2007. Date palm is one of the oldest domesticated fruit crops (since 4000 BC in Ancient Egypt), and one of the most important growing in desert areas (Ramawat, 2010). Date palm trees are widely spread in arid and semi-arid areas within 10° and 39° in the Northern Hemisphere, the optimal latitude being between 24 and 34°N in the Old World, and between 33 and 35°N in the West Coast of the USA (Zaid et al., 2002). It has also been introduced into other countries such as Pakistan, Australia, Mexico, South America and South Africa (Janick et al., 2008; Chao et al., 2007). Date palm grows well in areas with long and hot summers, no or low rainfall, and very low relative humidity levels during the ripening period (Zaid et al., 2002). Date palm can be grown from sea level up to an altitude of 1500 m (Ecocrop, 2011). The optimal temperature for growth is about 32°C, but the date palm can withstand up to 56°C under irrigation (Zaid et al., 2002). A date palm tree requires 0.21-0.56 m3 (0.72 m3; Rolland, 1894 cited by Zaid et al., 2002) of water per day. If ground water is inadequate, irrigation is necessary (Ecocrop, 2011; Peyron, 2000). Date palm is tolerant of windy conditions and can bear strong, hot, dusty and dry winds. It is thus used as wind breaks for more sensitive plantations. Date palm has also some tolerance to soil salinity but cannot be considered a true halophyte since it grows better on sweet soils than on salty soils (Zaid et al., 2002). The main by-products of date packing are cull dates, date seeds and date pedicels (Arbouche et al., 2008; Barreveld, 1993). Date processing also yields seeds, presscakes (also called date pulp) (Barreveld, 1993). Only cull dates and date presscake are considered below. The other by-products are fully described in Date seeds and other date by-products. Cull dates are fruits that are too hard, too small, blemished, of poor appearance, infested or containing foreign matter (Barreveld, 1993). Culled date are also fruits that have suffered from drought and dates unfertilized due to lack of pollen (Chehma et al., 2001). About 20-25 % of the production is fed to livestock (Williams, 1978; El-Deek et al., 2010; Chehma et al., 2001). They can be fed whole to cattle, camels, sheep and goats. However, the stone is undigested and it is recommended to grind the dates before feeding, provided that the cost of processing is outweighed by the gain in feed value. Unless they are very hard and dry, dates tend to clog the sieves of the hammermills and it is necessary to mix them with a dry material such as barley, maize or soybean meal. The optimal inclusion rate of dates in the mix is about 30% which gives good pellets, with the additional benefit that dates take the place of molasses as a lubricant and binder in the process of pelletizing. Less than 20% dates in the mix results in pellets of poor quality that require the addition of molasses. Grinding whole dates is also an energy-consuming operation because dates are dry and their pits are very hard (Barreveld, 1993). Pitting cull dates can be done by soaking dates in water and mixing them until the pits are removed. The resulting flesh (date mash) is then mixed with flaked barley and dried on a rotary drier. The date mash can also be used as binding agent in pelletizing and can replace molasses: no more than 13-16 kg date mash (i.e. 5-6 kg date flesh) should be added to 100 kg of concentrate if the resulting product has to be stored. The product should then have less than 12-15% moisture (Barreveld, 1993). Silage can also be made from chopped date palm stems or fronds (45%) mixed with cull dates (35%), wheat bran and urea (Khorchani et al., 2004). When dates undergo extraction for syrup or alcohol production, the extraction yields a by-product (press cake) which is made of exhausted date flesh and residual sugars, with or without pits. Press cake is a high moisture product that does not store easily and may become a disposal problem (Barreveld, 1993). Date palm has the highest salinity tolerance among fruit trees. The low soil requirements and high adaptability of date palm represent another advantage in salt-affected environments (Qadir et al., 2008). Date palm provides protection (shade and shelter) to under-crops (fruit trees or annual crops) from the harshness of the climate (heat, wind and cold weather). Date palm also prevents soil degradation and desertification (El-Juhany, 2010; Sawaya, 2000). Palm trees are a keystone species in oasis agriculture. They ensure an optimal use of space, biodiversity, water resources and the work force (Koohafkan, 2002; Sawaya, 2000). Date palm is a valuable crop for establishing a sustainable system of subsistence agriculture, thus helping populations to settle in rural areas (Sawaya, 2000). The by-products of date production have always been recycled by farmers and local populations, and have been considered as "an eloquent example of integrated sustainable use of renewable material resources" (El-Mously, 2001). There is a long tradition of using cull dates and date pits to feed animals, and the crop residues serve as raw materials to create household items, furniture and building materials (El-Mously, 2001). Dates are rich in sugar and the total sugar content, which also depends on the variety, varies between 60 and 76% DM and is constituted mostly of glucose and fructose. Dates have a low protein concentration (1.5-4% DM), which also depends on the variety. Algerian and Moroccan varieties, for example, have been found to be richer in protein than Saudi varieties (Boudechiche et al., 2008). Whole dates contain about 15% pits (El-Deek et al., 2010) and contain about 8-17% NDF, 6-11% ADF and 6-8% ADL. Dry matter content is comprised between 75 and 95% and is highly negatively correlated with sugar content (Boudechiche et al., 2008). Pitted dates and date pulp have a similar content, exept for a lower fibre content (more than 6% DM) (Williams, 1978). The high sugar content of dates and date pulp make them good energy sources for livestock (Alhomidy et al., 2011; El-Gasim et al., 1986). Fresh press cake contains about 70% water. It may or may not contain pits, so its crude fibre content varies from 9 to 22% DM. Like the fruit, its protein content is rather low (5-8% DM). Sugar content depends on the extraction rate and can be as low as 15% DM. Research on date press cake is very limited (Barreveld, 1993). Dates are fumigated to kill insects, often with methyl bromide (CH3Br) (Glasner et al., 2002). The maximum residue level for methyl bromide on dried fruits was set at 2 mg/kg by the Codex Alimentarius (Codex Alimentarius, 2011). Other pesticides are used, including carbamates and organosphosphates, which may leave residues (Khan et al., 2001). In organic date palm production, carbon dioxide is used instead of methyl bromide (Glasner et al., 2002). The presence of steroid compounds in date pits, notably estrone, progesterone and estriol, has been known since the 1950s, though the actual effects of these compounds on sheep growth and reproduction have yet to be clearly demonstrated (Barreveld, 1993; El-Gasim et al., 1995; El-Din et al., 2001). However, treatments with hexane and diethyl ether (combined in some cases with germination) have been proposed in order to decrease the amount of steroids (El-Din et al., 2001). Dates have been used for a long time to feed ruminants, due to local availability and low purchase costs. They have been used in sheep and cattle feed for both milk production and fattening. The nomadic Bedouins carry dates for their own consumption as well as their animals’ when desert grazing is inadequate (Williams, 1978). The nutritional potential of dates in ruminant diets has been studied in areas of production, where they can be a cheaper alternative energy source to cereal grains. Due to their high carbohydrate content and relatively low fibre, dates have an energy value as high as that of cereal grains such as barley (Boudechiche et al., 2010), with an in vivo OM digestibility of about 83-89% (Rihani et al., 1988 ; Al-Yousef et al., 1993). Crude fibre digestibility was found to be variable, ranging from 38% (Al-Yousef et al., 1993) to 74% (Rihani et al., 1988). However, the main limitation of dates is their low protein value, and protein supplementation is required when dates are included at high levels in the diet (Rihani et al., 1988). Dates are highly regarded as a feed by dairy cattle farmers (Robinson et al., 1973). It was noted that house cows kept by townspeople and oasis farmers tended to select the flesh and leave pits in the trough (Craig, 1975). Early research on the use of dates in dairy cow diets was judged inconclusive (Williams, 1978). Dates successfully replaced 25% and 50% of the concentrate ration of dairy cows although no increased performance resulted from the use of these feeds (Ali et al., 1956b). Date extracts fed as supplements to lactating cows did not lead to better performance in one experiment, and resulted in a loss of body weight in a second experiment (Robinson et al., 1973). Lactating Jersey cows fed fresh lucerne ad libitum and 6 kg of whole crushed dates did not lose weight, unlike the cows fed alfalfa alone, but their milk yield was lower. Protein intake, milk yield and weight gain were higher for cows fed 6 kg concentrate instead of 6 kg of dates (Robinson et al., 1974). In 2011, information was still lacking on the nutritional benefits of dates for dairy cows. In fattening cattle, some of the concentrate ration may be replaced by dates without detriment to growth rate, provided that protein level is sufficient (Fine et al., 1956). Young bull calves fed 1 kg/d of dates in addition to alfalfa (fresh or hay) ad libitum had a lower growth rate and feed conversion efficiency than the animals fed only alfalfa (Robinson et al., 1973). Male calves fed 3 kg of alfalfa hay, 2.8 kg of dates and 0.2 kg of fish meal had a lower growth rate than animals fed alfafa and concentrate, which the authors suggest was due to the lower protein intake of the date-based diet (Robinson et al., 1974). However, the replacement of barley by dates (28% of diet on a DM basis) had no effect on total DM intake and live-weight change in Zebu dairy calves (El-Hag et al., 1992). Many sheep studies have demonstrated that both date supplementation and the replacement of a cereal concentrate by dates can improve animal performance, due to the high energy content and high palatability of dates. Tested inclusion rates ranged from 5 to more than 50% of the diet DM. Usually, with dates below 25-30% of diet DM, there is no effect of replacement of the cereal (usually barley) by dates on voluntary intake, in vivo DM digestibility and live-weight gain (Al-Ani et al., 1991 ; Al-Dabeeb, 2005). In finishing lambs fed on concentrate-rich diets, the isonitrogenous replacement of barley by cull dates up to 30% of the diet increased total feed intake (+ 22%) and daily weight gain (+ 30%). Feed conversion efficiency was similar with 0, 15 and 30% of dates in the diet, but DM, NDF and ADF digestibilities were the highest at the 30% rate (Alhomidy et al., 2011). However, decreased digestibility and weight gain at 30% inclusion rate of dates have also been observed in male lambs (Al-Ani et al., 1991). At higher incorporation rates (45-50%), there are some risks of decreased diet digestibility (Al-Ani et al., 1991; Hmeidan et al., 1993) and laxative effect (Al-Yousef et al., 1993). Dried dates have however been used up to 50-55% of the diet without health problems in fattening lambs (Rihani et al., 1988). Early research showed that concentrates containing up to 45% macerated dates could promote satisfactory gains particularly with protein-rich forages (Ali et al., 1956a; Sarsam et al., 1954). Up to 15% dates can be added to forage before ensiling (Ziaei, 2010). Supplementing grazing ewes at the end of lactation with 0.35 kg/d of cull dates improved milk production and the growth performance of their lambs (Boudechiche et al., 2010; Mebirouk-Boudechiche et al., 2011). Replacement of barley by cull dates in the diets of breeding ewes in preparation for mating did not affect DM intake, DM digestibility and ovulation rate up to 35% of dates in the diet. Higher inclusion rates (50 to 75%) decreased weight and ovulation rate, and, at 75%, resulted in a lower litter size per ewe. No symptoms of acidosis or change in rumen fermentation were observed at the highest proportion of cull dates despite the high concentration in fermentable carbohydrates (Rekik et al., 2008). Dromedaries can be fed with cull dates, but in an experiment comparing the use of date by-products by sheep and dromedaries, dromedaries did not benefit as well as sheep from the inclusion of cull dates, and the optimal inclusion rate for weight gain was 25%. This may be explained by the better adaptation of dromedaries to the utilization of lignocellulosic materials and their lesser adaptation to cytoplasmic sugars (Chehma et al., 2002b; Chehma et al., 2004). Though dates were used to fatten pigs in Ancient Egypt, Syria, Cyprus and Iraq (Pliny the Elder, 77-79), there is scarce information concerning their nutritional value for pig nutrition. Digestibility values are high for carbohydrates and low for protein and fat. In a trial, 120 kg pigs ate up to 2.5 kg/d and digested the stones. Dates could replace potatoes (2 kg/d) without affecting weight gain and feed conversion (Richter et al., 1956a; Richter et al., 1956b cited by Barreveld, 1993). Whole dates available for poultry production are generally culled or non edible dates, leading to high variability in composition. Whole dates contain approximately 15% pits, and their energy value is significantly lower than that of pitted dates and date pulp (El-Deek et al., 2010). Several authors have reported good growth rates in broilers fed diets with whole dates or date pulp (El-Deek et al., 2010; Hussein et al., 1998). In some cases, high inclusion rates (24% to 30%) have been successfully tested with balanced diets (Kamel et al., 1981; Vandepopuliere et al., 1995). However, the total replacement of maize grain by whole dates resulted in decreased growth rates and an increased feed conversion ratio (Kamel et al., 1981). Date press cake (without stones) partially replacing ground maize at 5, 10 and 15% of the diet for broilers gave higher weight gains, but at the cost of higher feed intake per kg gained (Al‐Hiti et al., 1978). In a similar trial, the inclusion of pitted dates at up to 15% did not affect performance and the addition of an enzyme mixture was of no benefit (Jassim, 2010). It is recommended to use whole dates carefully in layer diets, and to limit their inclusion to 5% of the diet. Whole dates included at 4% did not affect layer performance (Al-Harthi et al., 2009). However, most authors have observed at higher levels a drop in egg production (Al-Harthi et al., 2009; El-Deek et al., 2008; Najib et al., 1993a; Najib et al., 1993b) although the digestibility of the whole diet is not affected (El-Deek et al., 2008). No major effect was observed on egg weight and egg quality (Al-Harthi et al., 2009). The use of enzyme cocktail to improve performance was not successful (El-Deek et al., 2008). In breeder quails, whole dates included at 15% in the diet maintained performance, but reduced it at 30% inclusion rate (Vandepopuliere et al., 1995). In 2011, there was no published information (feeding values or recommendations) on the use of whole dates in rabbit feeding. Given their nutrient composition and barring the presence of pesticide residues, dates should be a suitable feed ingredient for rabbits. It has been observed that dates that are slighly damaged, dirty or too dried are occasionally fed to rabbits in family farms, for example in Tunisia, but all that is recorded is that rabbits consume the fruits but do not eat the hard pits (Lebas, 2009, unpublished data). It has been noted that donkeys fed dates voided the pits whole (Williams, 1978). In Nile tilapia fingerlings fed isocaloric and isonitrogenous rations containing cull dates as a replacement for starch, weight gain, feed conversion, specific growth rate and protein efficiency ratio were improved with diets containing 15 to 45% dates. The diet containing 30% dates was superior to all other test diets in terms of growth parameters. Body moisture, crude protein and total ash increased with the amount of dates in the diet, while body fat was reduced (Belal et al., 1997). Immature dates (fruits fallen to the ground) could fully replace maize grain (30%) in diets of Nile tilapia fingerlings without affecting carcass composition and feed and nutrient efficiency. Growth was slightly lower for the date-based diets, but this was not significant (Omar et al., 1993). Al-Dabeeb, S.N., 2005. Effect of feeding low quality date palm on growth performance and apparent digestion coefficients in fattening Najdi sheep. Small Rumin. Res., 57: 37-42. Craig, P. S., 1975. Nutrient studies with Awassi Sheep. M.Sc. Thesis, University College of North Wales, Bangor, U.K.